This is my family’s fried tofu recipe with minced meat. This recipe is unlikely a familiar dish for the non-Chinese, as you may not find this in the Chinese restaurants outside Asia. Many of us are familiar with wonton noodles, General Tso’s chicken, and dan dan noodles. Those are the Chinese dishes regularly features on the menu. But in reality, these are not the dishes we cook at home in an average Chinese family. Fried tofu with minced meat is much closer to the heart of the regular housewives, which we called it ‘home cook dishes’ 家常菜. 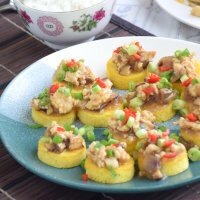 If you want to know what will be served in an average Chinese family, egg tofu topped with minced meat is one typical example. Usually, home cooked foods are quite easy to prepare, and there will not be any special ingredients required. Most of the ingredients are readily available in the kitchen pantry. I use egg tofu in my recipe because it forms a beautiful disc shape after cutting it crosswise. 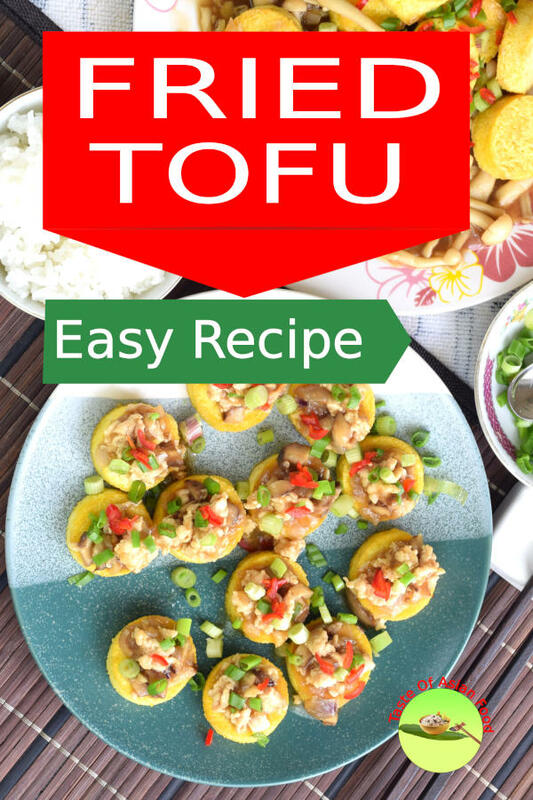 You can use other tofu if you like. You make use of whatever available in the refrigerator when you get hungry. That is the way what home cooked food should be. Let’s me show you how to make it. The first step is to prepare all the ingredients. My culinary textbook called it mise en place, but I have learned it long before I read the book, from my mother and through experience. Mince the garlic and chop the onion are the daily activities in my home kitchen, and I have to chop the onion in multitude in my restaurant until teary. Garlic and onion are essential aromatics. Things won’t turn out well without them even with extra ingredients and seasonings. Next, cut the meat into small pieces and mince it finely. Pork is the choice for most of the people. But I am using chicken breast meat in this recipe for a healthier alternative. If you prefer pork, I suggest you use pork with 20% fat and 80% lean meat. It always works out juicier and more tender. Soak the dry shiitake mushroom until fully hydrated. You can soak it in advance, even overnight. If you are running short of time, there is a short cut without sacrificing the quality- soak in hot water. It works. 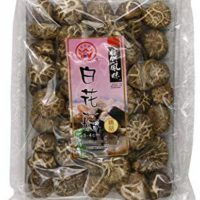 The common types of mushroom available locally (here in Malaysia) are the Shitake mushroom, king oyster mushroom, shimeiji mushroom, and enoki mushroom. You will most likely be served with any of these mushrooms if you dine in Asia. Feel free to substitute with button mushroom, portabello or any other variants. Cut the mushroom into small cubes. Set aside. Egg tofu (the Japanese type, usually sold in tubes) is my choice. It tastes better than other tofu since it contains egg. I also like its shape as I can do a little design with it. Cut the tube of egg tofu into about 1cm thick, and they will look like large scallops! However, you can use other tofu as long as they are not too soft and breaks into small pieces when you deep fried it. White radish pickle is a very traditional Chinese condiment. There are two types- sweet and savory. (They are not sour.) If you happen to get some, add a teaspoon of this pickle to the meat sauce. 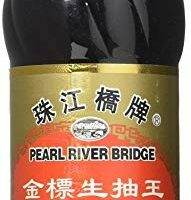 It adds a whole new dimension of distinct Asian flavor. The deep frying process is quite straight forward. Just to remember you are dealing with tofu. Be gentle! Put some oil into the pan. After the oil is heated, lower the tofu into the pan. Gently move them slightly during the first minutes to prevent them from sticking. It takes a few minutes for the tofu to firm up and change color. Flip the tofu pieces over to deep fry the other side until they turn golden brown. Remove and drain on the kitchen paper towel. 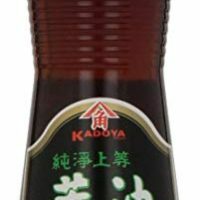 I am using the commonly available Chinese seasoning for this recipe- oyster sauce, light soy sauce, sugar, sesame oil, a dash of ground white pepper, some cornflour to thicken the sauce, and the mushroom water that I reserved. You only need to combine all of them. Of course, you can add the seasonings directly into the wok separately, but I do prefer my mise en place, which improves the flow of work during cooking. Next, add some vegetable oil into the pan. Saute the chopped onions and garlic until aromatic. Then put the minced meat into the pan and stir-fry until it turns color. Next in line is the mushroom and the seasoning that you have prepared. Let it cook over low heat until it starts to thicken. It ready. It is that simple. This recipe is flexible, so there is a lot of room you can make changes. 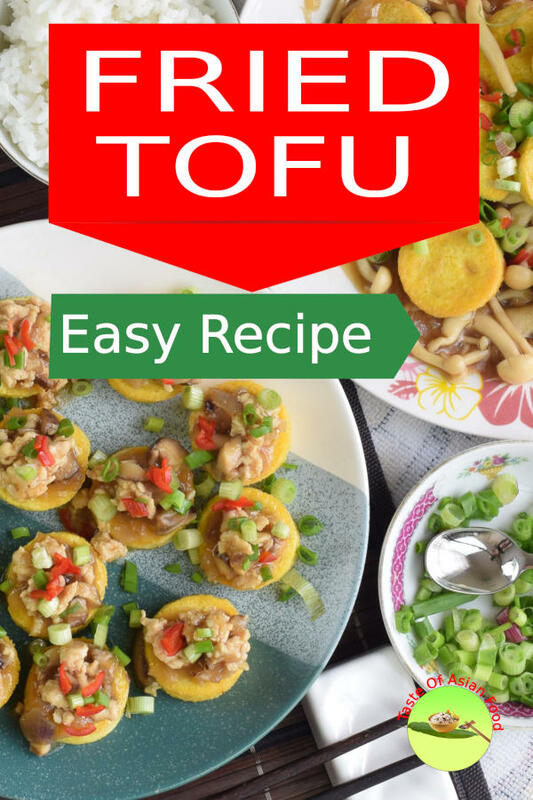 You can substitute the meat if shimeiji mushrooms for meat-free tofu dishes. Omit the mincemeat, use the shimeiji mushroom. Use more mushrooms as the substitute of the meat. Add the shimeiji mushroom to the garlic and onion. Saute for a while until the mushroom turns soft. Add the seasoning and cook until the sauce thickened. Add the tofu back to the mushroom. Have a quick mix gently, and dish out. Arrange the tofu pieces on a plate. Spoon the minced meat mixture on the tofu as the topping. Sprinkle some chopped scallion and red chili on top to garnish. 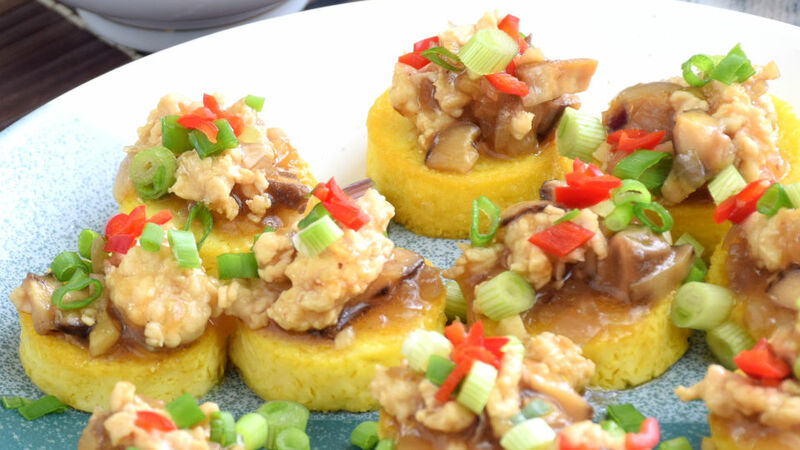 You can serve the egg tofu on its own or with steamed rice. This video will show you how to prepare the Malaysian style Tomato Rice. (5.33 minutes). It is located below the Instruction, above the nutrition value in the recipe below. Soak the dry shiitake mushroom until fully hydrated. Cut it into small pieces. Cut the tube of egg tofu disc shape, about 1cm thick. Deep fry the tofu until golden brown. Remove and drain on the kitchen paper towel. Add 3 tablespoons of oil to the pan. Saute the chopped onions and garlic until aromatic. Add the minced meat and stir-fry until it turns color. Add the mushroom and the seasoning. 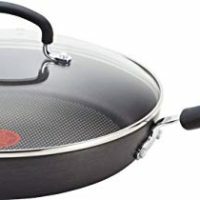 Cook over low heat until it starts to thicken.